Painters: Michelangelo, JMW Turner, Churchill, & Hitler. 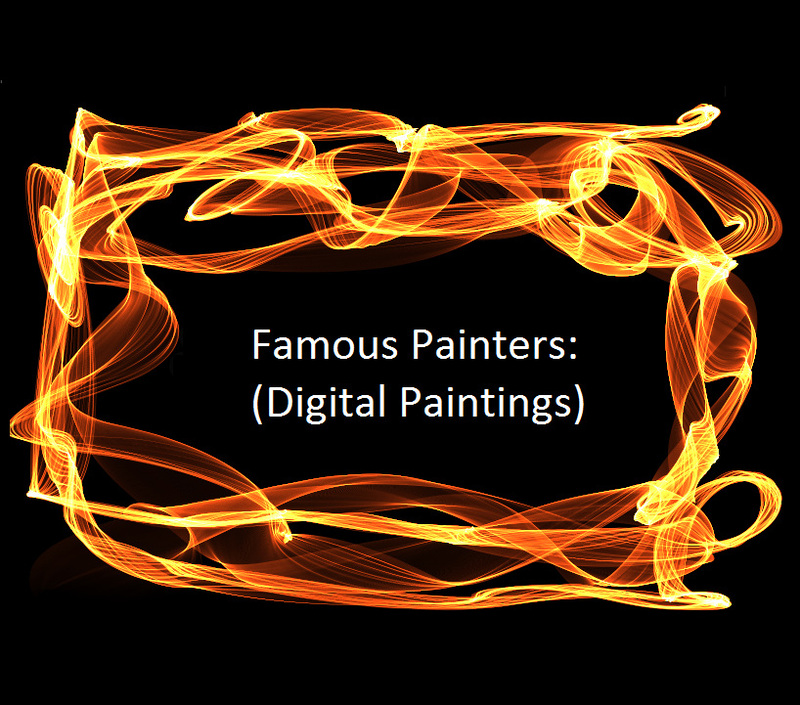 Welcome to Simhadri Software's Art Archive - Famous Painters. Welcome to our Art Archive. Here we illustrate famous painters over the period of time. www.simhadrisoftware.weebly.com - Art Archive 1 - My paintings using the techniques of Frank Benson, Claude Monet, Paul Cezanne, Vincent Van Gogh. Also photographs of monuments around the world. www.simhadriphotography.weebly.com - Art Archive 2 - Photographs of monuments around the world. My paintings of monuments using famous artists' signatures. www.simhadripaintwork.weebly.com - Art Archives 3 - My paintings using the techniques of Vincent Van Gogh, Renoir, Gauguin etc. www.simhadripicassoart.weebly.com - Art Archive 4 - My paintings using the techniques of Cubism, Picasso, Rothko, Mondrian, Klimt, Dali, Whistler etc. www.vijaysimhadridigitalart.weebly.com - Art Archive 6 - My paintings using techniques of Cezanne, Monet, and Van Gogh. Renoir, Picasso, Monet, Gauguin... these are many famous painters that we have covered in our earlier art websites. However in this website we aim to show the great painters works revisited & many others. Over time many great painters have left a great impression in the world. Yet, when investigated, now posthumously, what effect did they create on the art world? Which paintings became acclaimed, approved, and appreciated later? I, Vijay Simhadri, travel through time, looking at various famous artists (painters), and aiming to digitally paint using their unique artistic styles. I wish to give credit to all the originals, where they are located in the world, making the basis of my digital paintings. Ideally, this art archive shows art not for sale, and caters for the viewer's browsing, commenting, criticism and appreciation. It shows remarkable modern painters like Joan Miro (Spain), Wassily Kandinsky (Russia), Winston Churchill (UK), and Adolf Hitler (Austria/Germany). It also reveals my digital paintings of the renowned artist James Whistler (US) and of his most prized paintings. by M F Hussain (India), and S H Raza (India). John Singer Sargent (US), Edgar Degas (France), Rembrandt (Dutch), Michelangelo (Italy), Edvard Munch (Norway), Jan van Eyck (Dutch), Giotto (Italy), Diego Velazquez (Spain), Van Gogh (Dutch), Canaletto (Italy), Henri Matisse (France),Andy Warhol(US), Marc Chagall (France), Giotto(Italy),Pablo Picasso (Spain), Salvador Dali (Spain), Max Ernst (Germany), Gustav Klimt (Austria), Raphael (Italy), & Joseph M. W. Turner (UK) etc. In the case of John Singer Sargent, James Whistler,Claude Monet, Pablo Picasso, Wassily Kandinsky, M F Hussain,Joaquin Sorolla, S H Raza, & Joan Miro I have tried to recreate their artistic style of painting ie. brushstrokes etc. I have used distinct digitally painted brushstrokes in these cases to recreate the paintings, at the same time making an attempt to preserve their style. Whilst, in the case of Edvard Munch (Norway) I have attempted to use his own authentic color palette. I would like to give credit respectively to www.johnsingersargent.org , www.william-turner.org & www.edgar-degas.org for their John Sargent, Joseph Turner & Edgar Degas original paintings used extensively as a source. For each painting, click on the thumbnail, then right-click on the mouse, and select 'View Image'. Use the Zoom In (+) magnifying glass, to see each digital painting enlarged. You may see the brushstrokes, when the digital painting is enlarged, to compare the different painting styles. I am very liberal, and you may copy and reproduce these digital paintings freely, however only for non-commercial purposes. (Artist of the Digital Paintings). All the paintings that are entirely my own creation are copyrighted.